Project Airbus must resume its work for the A320 family VC. Francois really did an amazing job about the gauges and FDE's. If they were incorporated in the VC of PA320, imagine the result? Just a thought, guys. BTW francois, any plans for PA380 gauges and FDE? beta 0.72 works fine, just the APU sound loudness should be slightly reduced IMHO. panel below the FMC can also directly be toggled, please see pic below. The 2D freq. panel works fine, but the VC option would be as an alternative favourable too. I cannot do anything for these problem, because it is an error in code of the MDL file of the Miscrosoft VC. There is no solution ; I am sorry. We cannot change anything in a MDL file 'because the file size change and after it was unsuable. About the radio tune knob, this is the mouse areas that aren't coded in the MDL file. I can't repair. Got my issues sorted with the Aerosoft Airbus, after a complete re-install of FSX ( I had made a mess of it). Can't wait to try out this new panel, I will install tomorrow and use it exclusively until you finalize it Francois. Thanks again! A work of art man. Even terrain! I am very close of the final version...I think all will ready in march. beta 0.72: One thing discovered, that the glass displays when cliqued to windowed mode can not be scaled. It is volontary that the popup windows of galss panel are no sizeable, because, that occurs bugs with mouse area detection. But I can change these size : You think that there are too large or too small ? - New formula to calculate the Vref and the VAPP (my old formula had a error in the wind component calculation). Now, the VAPP = VREF + ( 5 kts or 1/3 of the wind component in the front axis of the aircraft, with a minimum a 5 kts and a maximum of 15 kts) according the real Airbus data. - Better smoothness in the pitch change in the first part of the climb. - I have began to write the new STATUT page on the secondary ECAM. It is a the palce of the old checklist, and updated wiith the flight phases. Just the take off and initial climb for the moment. Can you tell me what is your opinion about this Statut page and if I must continue like this. This is the last thing to do and the panel and the aircraft will be completed ! Last edited by fdd_fr on 16 Feb 2014, 13:57, edited 1 time in total. Last edited by Airbus Fan on 16 Feb 2014, 15:33, edited 1 time in total. Enclosed the glass panels beta 0.72 Version, which IMHO shows an glass panel oversize. The former solution was easy to scale and arrange accordingly. BTW I had never a mouse problem in the past while adjusting and resizing the glass panels. I think that each panel user will have different preferences in scaling. So my prefernce would be to get it as shown in the pic (I am using WVA=true , 55 inch Monitor). Select full screen then select manually HD1080P in the bottom right settings of youtube. Last edited by fdd_fr on 16 Feb 2014, 17:54, edited 1 time in total. regarding glass panel scaling: I have only chosen A319 V3 for the pics above, because I had this "old" version still on my computer. The ability to properly scale up and down was also possible since beta 0.71. To prevent any misunderstanding: So I would prefer to get the latest panel version but for sure optional with the ability to scale the glass panels. After, you will can resize the popup glass panel windows. I am so sorry, but I use for this panel the XML code only FSX SP2 compliant. This panel will not work with FS9 or FSX alone. Only FSX SP2 or Acceleration pack or PREP3D. Sorry, but many GPS macros (about the TAWS or other functions) are not compatible with FS9. First Autoland, but too much wind not in the axis and many crazy AI aircraft ! I must work the flare ! create this line (sizeable=1) save your file. After, you will can resize the popup glass panel windows......"
It works! Really simple to adjust and worth to include and explain this option in your upcoming handbook. I am happy again. [Window07] not adjusted at first, as there was no line (sizeable=....). Which panel is meant here in the VC? Hehe, nice video Francois. I want AI behavior as realistic as possible and that surely isn't it! I do have a question though about the approaches. Is the FMC coded strictly for stable approach or is there an option for decelerated approaches? Approaches are coded in the airports data files that we write with FreeNav DB group. FD-FMC execute the approach according the data write in the file (in managed mode), but you can toggle in selected mode and choose your speed or ALT as you want. All the SID , STAR and Approaches of the database airports are coded according the official AIP charts of each airport. We follow all the speed and altitude constraint of the charts. But these files are not updated each month like real AIRAC; But they include all the real data for 2013/2014. Everybody can create these data files. I have wrote a user manual to create these files; You need only EXCEL or an other software that can produce CSV files, and PLAN-G that is a fantastic free software to get the world map through FSX. In this line, the FMC has all the information to manage the speed and the altitude to land. Don't be afraid. I have a EXCEL form that is very simple to use to write the data. The most difficult thing is to read properly the AIP charts. But it is very exciting to create this database. We have realized some airports with difficult approaches ; for example : Innsbruck, Madeira, Aspen Co/Sardy, or Nice LFMN, with the 22L/22R appraoches that are very stressful ! A330 is too big for Innsbruck, but with the A320, this is a challenge ! Yes, I am just about ready. I needed to be able to see it all in action first, to understand what I was doing. I made many flights from KATL/KDCA so I'll begin on those, some day. I have been unusually busy lately not even able to fly much. I you want, I can create the datafile for KATL and KDCA. So, can you wait one or two weeks, because I work today on EDDM . the most actual German Airports of the Database have only SID for the moment and some with errors, so I correct and add STAR and Approaches and I work on the same time to finish the A320 panel and adapt the panel to the A330. So, I complete EDDM (I will finish at the end of the week) and I will create KATL and KDCA. The new PA VC is not completed, so for the time being, I use the A321 VC with my set of gauge. That would be great Francois, but you have already done so much, I would hate to interrupt your work over something I may be able to do myself. On your last panel update (v0.73) only on the CFM version when i am on the cockpit (F10) on the top left corner there are some red words about the air etc and they are a bit annoying! I don't have this issue on IAE version (v0.73) and i didn't had it on the previous panel versions both on IAE & CFM! Any help how to get rid of that? The debug gauge will be disable. Thanks man! I am looking forward for your FMC 321 panel! Francois, had an odd thing happen, not really sure how to report it. I was going to make a flight from KSEA/KLAS. One of the waypoints looked out of place but I thought it might be because trying to gain altitude over the mountains. When it looked like I was going to clear, I deleted the waypoint. As soon as I did, I could not make the flightplan active again. Ended up over on my side 90 degrees and nose down. Not really sure what happened but I assumed that to delete one waypoint would make the next one active? KSEA is one of the first airport that we have realized (and only the SID) so, maybe there is some error in waypoints. I am working of the first aiports of the database to correct them but I have not yet work on KSEA. - This waypoint must be not the active waypoint when you delete it (because in this case, when you delete the active waypoint, FSX reset the flight plan and the first waypoint of the flight plan become the active waypoint). But if you open the FMS page, and slect the F-PLAN page, you have on the map, on the upper right, 2 areas "WPT+" and "WPT-", that allow to change the current active waypoint (by increment or decrement) . So when you have deleted your waypoint, the current active Waypoint was returned to the first waypoint (Departure airport); by clicking on the "WPT+" you can change the active waypoint to avoid the aircraft comeback. With this "button" you can "jump" a waypoint; this is a better solution than detete it. - YOu cannot delete a waypoint linked to a constraint (speed or Alitutde), because, the FMC will not know where the constraint is. This is a better solution to use WPT+ than delete a waypoint. Important thing : You cannot delete a waypoint of a STAR or an approach, because , there is many data linked to each waypoint of STAR/Approaches used by the FMC (Speed, Altitude, holding pattern, teardrop turn , ILS or VOR frequencies.........). I will check next week KSEA (and update with STAR and approaches). Ok makes sense, thanks Francis! I think that I have found the problem with KSEA. and the old 16R/34L is now 16C/34C. So I will update this irport, by creating 2 versions, because there is an AFCAD of the Alpha Indian group that update the airport in the new configuration. So I will create a specific version with 2 runways for the Stock airport BGL and a variant for the Alpha Indian group AFCAD, with the 3 runways, with in all case, SID , STAR and Approaches. I am working on the beta 0.74, that will be the last; After, I hope to the release version. I have modified VAPP calculation that was wrong; Now , this is the real "AIRBUS" calculation with the right wind component. I think that I will post the last beta panel this next weekend. The final version sould be to end of March. Now, I think that all the bugs are fixed. The FMC works very well.. The distance indicator during ILS approch does not display correctly. The popup PFD values are correct. That means that the same code gauge is executed 3 times per cycle, and I think that can produce asynchronous result. Some parts of FSX are mysterious for me today, but I will search a solution to this problem. I will post today a major update of the panel, with the ECAM Status page completed, and some bugs fixed. and others auditive message that we can hear in a cockpit. I have all the code ready to include these sounds, but I am franch anfd my english accent is horrible. So , if someone can record these callout, in Wav format, 44100 Hz. And if you think about other callout, let's go, I can add them. wulfbindewald, I havn't this bug. 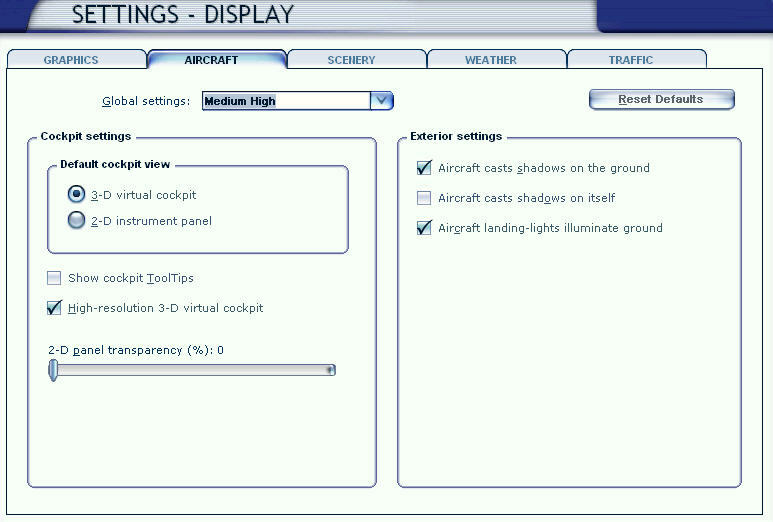 Have you select "Virtual Cockpit 3D" in the FSX general setting like the picture below ? the FSX AC control panel entries correspond to yours. I am using the A320 also w/o FMC, but I can´t imagine that this should be the culprit. I try to figure out the next days, which systematics are behind this bug. In the zip filel, you will find the classic folders "CDM" and "IAE" . You will find in the zip file a "Sound"folder : Inside there is the updated sounds that I use in the VC: "Callout_FD" ; copy and replace the existing verions of this "Callout_FD" folder in "Sound" folder of your FSX. So, you can delete all your previous flight save files. - Now, when you save a flight and when you completed this flight later, all the FSX savegame files about this flight will be deleted when the aircraft will land. This new function allow to keep a folder clean and avoid to have problem if you to a new flight with the same departure and arrival. The previous version of the panel deleted only the flightplan file and the FMS data backup file. NOTE : This new function can work only if you use a specific synthax for the name of the save file : "departure ICAO code in uppercase" + space + "to" in lowercase + space + "arrival ICAO code in uppercase" : e.g : LFPO to LSZH . If you don't respect this synthax, only the flight plan file and the FMS backup file will be deleted when you will land. - the old FMS page that was used to save a flight plan is now replaced by a page for the futur oceanic tracks ( NATS and PACOTs ) because this save flight plan page was unnecessary since the panel save the modified flight plan and the FMS data when you save your flight by the FSX menu. The Sea tracks page will be for the A330/340/380. - secondary ECAM "Status"page is now completed . Tou can display it by clicking on the bottom of the display. - in the previous version, the fuel burned by the engines was lost, when the flight was saved. Now, the FMS keep this information in his backup file. - New organisation of the gauges in the Panel.cfg file for a better efficiency and avoid incomptibility between 2D panel and VC or popup gauges. - I have decrease the APU sound. In the future, the new Doug Dawson gauge will allow to me to have a progressive startup and shutdown sound for the APU, and to have a specific sound when you are in the cokpit or for the exterior view. But I need to learn the instruction of this gauge. panel beta 0.74: what can I do to lit the autopilot panel? Do I miss an extra switch? I already noticed my stupidity and I've re-upload the correct panel. Add the red line that is missing in your version. thanks for the quick update. It works. One peanut found: no switching sound for "strobe on". There is still a little bug in the panel 0.74, about the refresh of the situation flight when you abort a flight and begin another flight with the A320. In some case, all the string variables are not reseted to empty values, so It occurs in some case taht the second flight savegame will have a flight plan name file of the previous flight. I have found the solution to fix this bug and I will post tonight or tomorrow a patch to fix this problem. Here is a small patch to fix a bug that can occurs when you save a flight, during a second flight and don't completed the first flight (in this case, the flight plan and FMS saved files have a wrong name. This patch fix this bug. This patch include 3 XML files , to copy and replace the existing version in the "A320_FMS" folder of each panel version (CFM & IAE). As far as I can see I've done a correct install but there seems to be something wrong with the new sound gauge perhaps........any thoughts?